Yea, my fiber exchange project is complete! 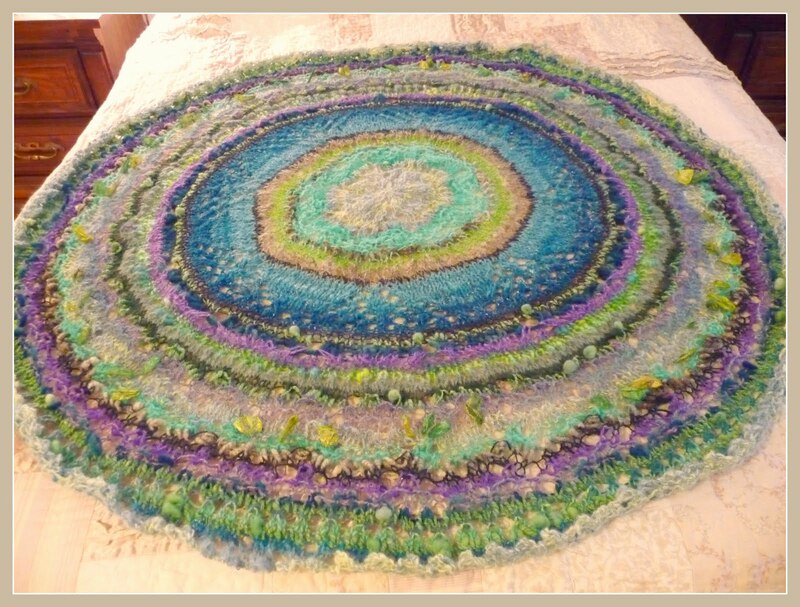 I used all the different yarn I spun to knit up this circular shawl and I am super pleased with how it turned out. I was really mindful of all the colors as I added them in, all the while wondering how harmonious the final composition would look. I was concerned that I might over play my hand in the color department, I like to see a lot of color, but didn't want it to come out looking like I knit it for clown! Pictured above unblocked, the shawl measures 50" across. The pattern I used is called MorPork Pie, by MMario, it's an awesome pattern and an easy knit. 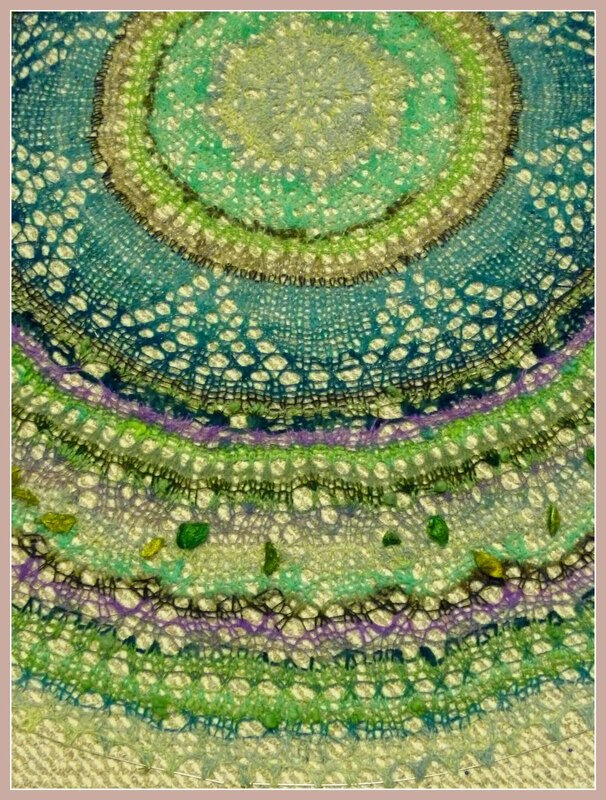 I used large needles, size 15, to accommodate the various art yarns I used. 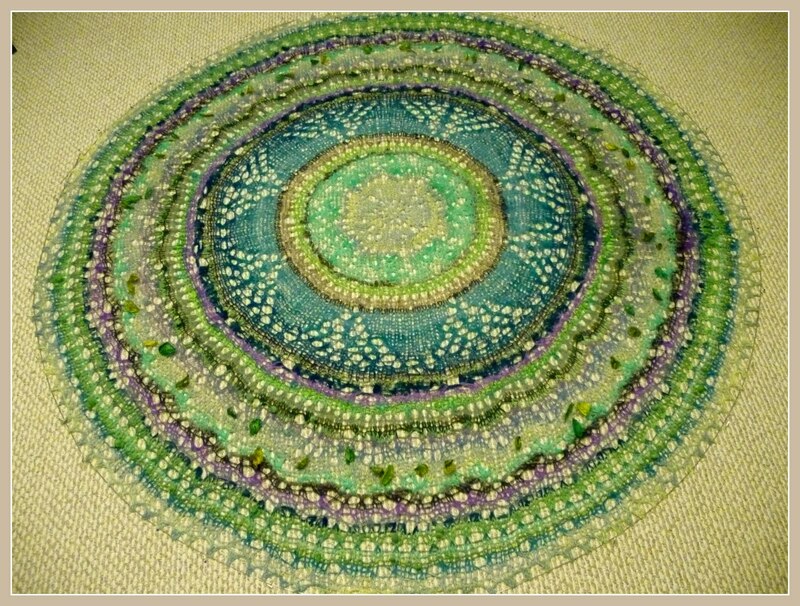 This gave even the chunkier yarns a lacy look. I worked the pattern pretty much as written, adding occasional straight knitting rows where I needed them to help transition the art yarns. 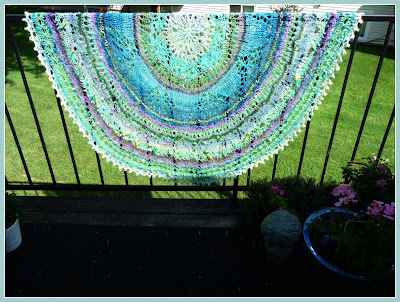 I left off the pattern at row 80 and added my own border, it was already plenty large enough! 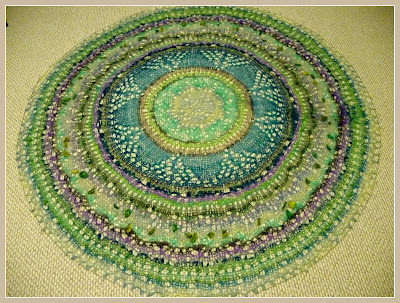 Here I've got it all blocked out, which itself was a labor of love, morphing from one irregular circle to another as I slowly moved it into a nice circle. You can't imagine how pleased I was when it measured the same distance across when checking multiple cross sections. It went from 50" unblocked to 66" fully blocked. The shadowy line you see whispering through the right hand side is from the loose tails of the weave-ins. I wove in all the ends, but did not snip them until after it was off the blocking wires. I wanted to make sure I had room make adjustments if needed, to blend the weave-in section to the pattern if I found I had gone too loose or too tight while sewing in the tails. It all worked out thankfully! Nicely fluttering in the breeze, I love all the colors and it was really educational working with so many new (to me) fibers. This project includes Blue Faced Leicester, Finn, Merino, Alpaca, Romney, Cheviot, Jacob, and Mohair. Plus my add-ins of Angelina and the Indonesian Silk cocoons I dyed and spun into one yarn. I'm pleased to have this project completed, but it was such an enjoyable process I almost hated for it to end. Good thing I have other projects calling to me! Beautiful colors...what a nice blend of fibers too. This one is really special, Melissa!! 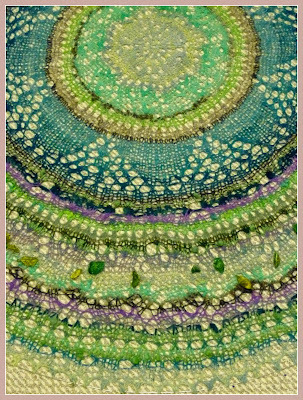 I think the colors and types of different fibers and art yarns really 'work' together in this shawl!